I have an opportunity to make some items for an artsy frame shop that features work by local artists. 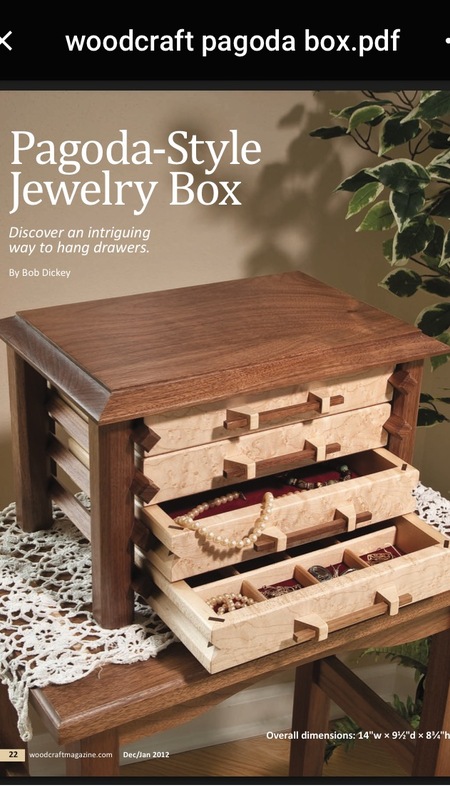 The owner asked if I could make some tables and jewelry boxes so as a first try I built this prototype box from the plans I downloaded from Woodcraft seen below. I chose it as I knew it would require me to step up my game and make some very exacting measurements and cuts and develop some skills that I would need to have going forward. I also wanted to incorporate some of the spalted maple that I’ve had for a couple of years. I wanted to make the drawer fronts from one piece of spalt as I thought it would add to the overall look of the project. I used my new miter lock bit (thanks Rich) as opposed to the splines used in the plans to join the drawer parts. I figure I can make a few different versions by simply changing the type of wood used for the drawer fronts, or even the top and legs. I made the jigs as described in the plans plus a few others so as to make it more repeatable in the future. Nicely done. Lot going on in that wood. Looks awesome. Love your wood selection. You realy’‘nailed’‘it! So beautiful and special design. Details are so fascinating- handles and railing system. I love this design and it’s a real eye catcher. It exhibits a lot of fine details and craftsmanship. Very nice design! Unique box with lovely woods. Well done! I have begun embracing fixtures for a lot more wood working. Things like aligning those handles are just soooo much easier. You have a winner with that spectacular wood! Beautiful box, I like the way the grain pattern on the drawer fronts resembles oriental silk paintings – it really works well with the pagoda style. That is a awesome looking work of art. Congrats on Daily Top 3, well deserved! Stunning work, Andy. Truly flawless. That should fetch a pretty penny. Wow! That is a really beautiful build.